Starring Charlize Theron, James McAvoy, John Goodman, Til Schweiger, Eddie Marsan, Sofia Boutella, Toby Jones, Roland Møller, Daniel Bernhardt, James Faulkner, Jóhannes Jóhannesson, Bill Skarsgård, Sam Hargrave, Barbara Sukowa, Attila Arpa and Martin Angerbauer. Distributed by Focus Features. 115 minutes. Rated R.
By all rights, Atomic Blonde should not work. It is a kinda outdated spy-action period piece, which takes place in the shadow of the falling Berlin wall. Its big final reveal is fairly similar to the surprise ending in another communist-based spy film that came out less than a decade ago. I won’t reveal that film’s title so that I won’t spoil Atomic Blonde’s ending. 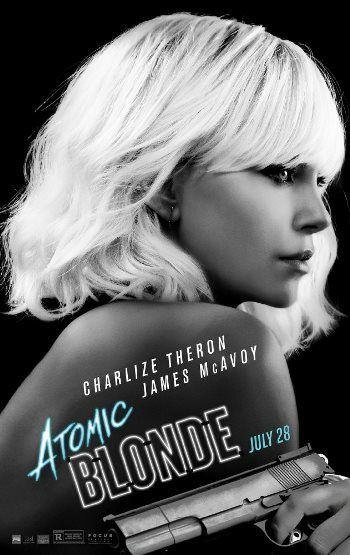 But when you see Atomic Blonde, you’ll probably know what I’m talking about. The action sequences are cartoonish and ridiculous, and yet somehow due to Theron’s wonderful grasp on the character they are campily fun in the overblown context of the film. There are really lots of reasons why Atomic Blonde should be a bit of a dud. That’s why it’s nice to see how enjoyable the film ends up being. It’s not exactly a good movie, but it most certainly is a fun movie. And honestly, that is all that Atomic Blonde is trying for. So good for them: Mission accomplished. That success is almost 100% due to Charlize Theron. She takes what could potentially be a bad (or at least blah) film and makes it better, simply through the strength of her charisma and personality. Add to that a fantastic late 80s new wave soundtrack and Atomic Blonde is an old-fashioned cold war hoot. Just going in expecting it to not make much sense, just have lots of wild fights and explosions and overacting. Take it on its own terms and you’ll probably like it. Start thinking about the story and it will probably collapse like the Berlin Wall coming down. Copyright ©2017 PopEntertainment.com. All rights reserved. Posted: November 14, 2017. Tags: Atomic Blonde, Attila Arpa, Barbara Sukowa, Berlin, Berlin Wall, Bill Skarsgård, charlize theron, Daniel Bernhardt, eddie marsan, James Faulkner, James McAvoy, Jay S. Jacobs, Jóhannes Jóhannesson, john goodman, Martin Angerbauer, movie review, PopEntertainment.com, Roland Møller, Sam Hargrave, Sofia Boutella, spies, Til Schweiger, toby jones. Bookmark the permalink.